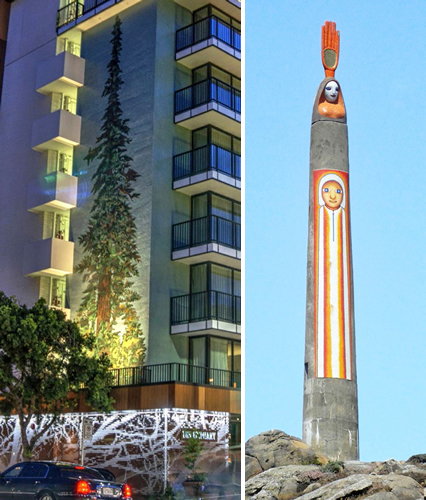 Left: Mosaic of El Palo Alto, a thousand-year-old redwood tree, for the Epiphany Hotel in Palo Alto. Right: The 72-foot-tall 'Expanding Universe' peace obelisk with Benny Bufano at the Timber Cove Inn, Jenner. 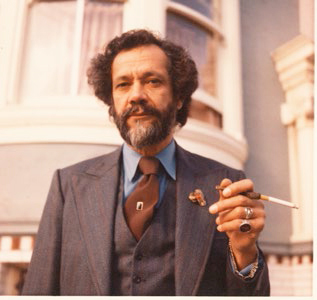 Pardiñas the sharp dresser, shortly before his death, in 1975. Morantes remembers a man who woke early and went to bed late, worked hard and played hard. "There wasn't a wasted minute in his life. A high-energy guy," he says. Ilka, who saw her dad on weekends, says each get-together was an adventure. "We'd be driving to the beach, and he'd say, 'Oh! Let's go stop at this gathering! Let's do this! Let's do this!' For us as kids it was just one roller coaster ride." "When I would come to San Francisco, he would say, you have to go see this show, you have to see that show," says Pardiñas' friend, Los Angeles artist Bruria Finkel. He liked a wide variety of art, she remembers. "He was a voracious reader and was self taught," Ilka says. He was fond of the poets Neruda and Lorca. "And he could spout it too," Gabrielson says. "He was a highly developed yogi," Ilka says. "You'd come into the room and see him in the most advanced yogic positions, standing on one leg with one leg crossed over his knee, with his hands extended, in a loin cloth." Despite his success in the business—his mosaic work on BART made him the most prolific artist for the transit system—Pardiñas was hurting financially in the early '70s. Several friends helped him out. Morantes says his partnership with Lenny Cahn seems to have faltered. "Where the money went, I don't know." "I think people were taking advantage of him," Morantes says, "whether it was borrowing money, or getting him to do things for them, or getting them out of trouble." Ilka says, "People would give him jewelry. Then he'd pick up a hitchhiker and he would give away the rings. 'Here, take it. Have it. Enjoy it.'" "I think that my dad was really looking for something higher. He would talk with Lenny and with other people for hours and hours, that material objects are not important. That's why he gave things away." On September 22, 1975, Pardiñas died unexpectedly in the San Rafael home of a friend. He was 51. Friends were shocked at his sudden death. Memo Morantes believes Pardiñas was on the cusp of a career shift towards more of his own design work. "He wanted to do his own thing. 'This is my art work,' and somebody would commission him to do a project." Bruria Finkel too says his premature death was a loss to the art world. "I think his artistry probably didn't reach its apex. But he had all the good things to make it happen."